In a sea of so many makes and models of motorcycles there's no sense in guessing what the right type of bike is for you. Buying a motorcycle and having it be the wrong one can be an expensive lesson. Here's a simple guide written to outline the various types of bikes out there and help you in your search. Standard � Years ago most bikes were Standards. With a Standard your sitting position is upright, placing your back at a more perpendicular position than a sportbike or cruiser. Standards are great for all day riding, or general commuting. If you throw some luggage over the back of them they make a good bike for over night trips as well. Typically Standards don't have much body work on them, however in recent years some manufacturers have began to make their Standards look a bit stealthy with fairings. Examples of Standards include Honda's CB750 Nighthawk, Suzuki's 600 & 1200 Bandits, Kawasaki's ZR7S & Z1000 (shown), Ducati's Monster series; and BMW's R1150R and F650CS. Versatile, practical and fun in more ways than one would best describe the Standard. Cruiser � Over the years the Cruiser has gained a lot of popularity. From the chopper romance of movies like Easy Rider, Wild Angels and all the other biker movies that Jack Nicholson and Peter Fonda wound up in between 1965 and 1972, the Cruiser has been ruling the city streets of many a town. Often highly decorated, Cruisers are always fun to look at. 'The more chrome the better' many a Cruiser owner would say. With a lean back position and often small seats, Cruisers are fun for short hauls, but get a bit tiresome for many on long hauls. Nonetheless there are those who take theirs to the Sturgis Rally every year. Cruisers provide, on average, the lowest seat height, making them a favorite with shorter people. Common Cruiser models include most current Harley Davidson's including the Fat Boy, Softail (shown), Dyna Glide and Sportser models; Honda's Shadow and Valkyrie's; Yamaha's Roadstar series; Moto Guzzi's Stone series, BMW's R1200C and Suzuki's Intruders. 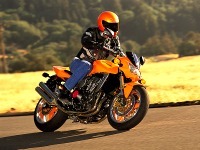 Sportbike � Sportbikes are the incarnation of all things racing applied to machines for sale to the general public. High end suspension; finely tuned motors, carburetors and exhaust; lots of plastic body work and brakes that stop on a dime best describe a Sportbike. The drawbacks are many however. The Sportbike was originally intended for racing, hence the lean forward design. If your back isn't strong, don't expect to feel great after a 300 mile day in the saddle. Because of the overall high performance engineering of these bikes, 90 mph can feel more like 45 mph which can lead to unnecessary speeding violations. Another typical characteristic of a sportbike is the uselessness of the rear view mirrors which typically provide the operator with a great view of his/her elbows, but not the traffic behind. Examples of popular sportbikes include Honda's CBR (CBR600RR shown) series, Yamaha's R1 and R6, Kawasaki's Ninja series, Apilia's RSV1000 and Buell's Firebolt. Touring � Touring bikes are something of the Winnebago's of the motorcycling world, only more fun. Their excessive weight makes them a bit unwieldy on tight corners, but just what the doctor ordered for a week long trip to Anywhere, USA and beyond. Touring bikes typically come with all the luggage space you'll need built right into the bike. Most tourers are designed with an upright riding position making long days in the saddle pretty comfortable. Popular tourers include the Honda Gold Wing, BMW's K1200LT (shown), Kawasaki's Voyager and Harley Davidson's Road King. Sport Touring � Performance meets all day riding in the world of Sport Touring. Manufacturers have combined the performance of sportbikes with the ergonomics and storage ability of touring bikes to create the Sport Touring category. Typically lighter than touring bikes, Sport Tourers allow the rider the ability to ride all day with little pain and enjoy every curve along the way. If you're turned off by the back pain of a sportbike and the 900 plus pounds of a touring bike, the Sport Tourer may be just for you. But beware, because of their smooth silky engineering you just may get lulled into a high speed citation. Common Sport Touring bikes include BMW's R1150RT, Ducati's ST4, Honda's ST1100 & ST1300 and Yamaha's FJR 1300 (shown). Dual Sport � If ever there was an SUV in motorcycling, the Dual Sport category would have to be it. These are machines that are capable of both on-road and off-road riding. As for the later, some more than others. 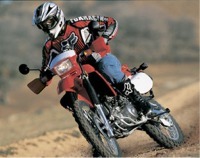 In the days of old, Dual Sports were called Enduros and were made popular by lines like Honda's SL series. A small Dual Sport in the 350-500cc range is capable of taking you to a single track dirt trail via the interstate, getting you all over the forest and back home again. But weight and mass play a role in dirt agility and Dual Sports over 700cc's are typically not the ultimate weapon for trail riding, but can offer hours of fun on unimproved dirt and gravel roads such as fire roads. Beware, Dual Sports that sport an exposed plastic gas tank (including many KTM's) may not be licensed for on-road use in some states (including Washington)and are considered illegal in National Forest areas anywhere in the U.S. Popular Dual Sports include Suzuki's DRZ400S series, BMW's GS series, Kawasaki's KLR series, Honda's XR650L (shown), and Triumph's Tiger. For more on buying a Dual Sport click here . Sidecars & Trikes � So three wheeling may just be the thing for you? Many bikes can be fitted with an aftermarket sidecar and there are a number of trike conversion kits available for cruisers and touring bikes. Three Wheelers are popular with those who are not capable of keeping a two wheel bike upright, for others they are just plain fun. With a sidecar you even have the capability of carrying a third and sometimes even a forth passenger. In fact, some folks just enjoy shoving their dog into the "Hacke" and going for a ride. Most three wheelers are a bit more capable in light snow as well. The drawback of both is that they do require some additional upper body strength to handle them. "Flying the Hacke" as it's called is when a sidecar operator maintains the bike on only two wheels, a perilous thrill for the passenger indeed. Effective in 2004, Washington three wheel operators will be required to carry a separate endorsement from a motorcycle to operate their three wheeler. For more informationclick here . Scooters - If you're primarily looking for transportation in the city, a small sized scooter is a superb choice. But nowadays we have a whole new generation of super scooters to choose from like Honda's Silver Wing (600 cc) and Aprilia's Atlantic 500 (shown). Whichever size you select you'll find a scooter to be an excellent choice for city duty. They're light, easy to park, have automatic transmissions in most cases, and if the wheel size is over 15" and the motor is under 50 cc you won't need to have an endorsement to ride it in Washington state. Vespa is a name that most think of when starting to think about scooters, but other manufacturers like Aprilia, Honda, Yamaha and Suzuki make some excellent scooters that typically pack more value and size in per dollar spent.